Hunter and I are taking a few days for R&R (research and relaxation) in north central Arkansas. We were on our way on a leisurely drive from Conway to Cherokee Village when I realized I was tired and snappy and needed to get a phone charger out of the back of the vehicle. We pulled in at this red-roofed restaurant that had no cars in front of it on Arkansas Highway 25. I had pulled the cord out of the back and was walking around the car when I noticed the OPEN sign was lit. Like a dork, I went up and peered through the glass and saw someone peering back at me. Hunter told me when I opened the car door she really wanted a bite to eat. Our eclectic route was headed next to Guion and it was Sunday, so well knowing our diner roulette might not turn up anything else for a while, we went in. DJ's Diner is a classic eatery decked out in red and wood, with booth seats all around the main dining room and tables in the middle. The menu reminded me of Greenbriar's Wagon Wheel Restaurant with its tri-fold design, breakfast and burger listings. My adled brain wasn't processing things but the waitress was sweet and brought me tea and gave us all the time we needed. When I asked her about what was good, she asserted that burgers and fried chicken ranked high. I couldn't face fried chicken. So I asked for a jumbo cheeseburger. Hunter and I, as usual, did some onsite learning, with me talking her through calculating change, while our food was prepared. Soon our burgers came out. Hers was pretty standard - she had asked for lettuce and tomato and they got it right, not putting on cheese (she's still in the no cheese on her burger stage) with crinkle cut French fries. My jumbo cheeseburger was ample - served on a seedless bun, a third of a pound patty glued to the top with a single slice of processed cheese. At first, despite the abundance of vegetation, I was concerned I'd received a plain jane pre-formed patty. On first bite, I considered whether this might instead be a burger-form patty (pressed into a ring) since its seasoning was onion-strong with just a hint of black pepper. The chopped white onions, slices of tomato and leaf of iceberg were pretty standard but good. The onion rings were marvelous. Hunter kept trading fries for the rings, and I let her. It could have been a pretty average dinner, but then there was pie. I didn't include DJ's in the new book because pie isn't on the printed menu, but I discovered it's a standard for the specials board. Usually when they appear in that fashion, they happen to be from Flywheel Pies. Nope, these were small, handheld pretties ceated by the owner's mother. I was concerned when the plate came out, with its overwhelming dish of vanilla soft serve ice cream that towered over the minute pie. But when Hunter and I split it, it was thick with a rich homemade cocoa filling, a hot molten chocolate too robust to have come from a pudding box. Our waitress had asked if we would want it warmed and it was warm... hot... frankly, it was napalm-hot, and without the ice cream to soothe each bite, it would have been searing. What it was, though, was a marvelous, buttery package of fudgy delight. We had split one between us and despite the diminutive size, this one pie with ice cream was plenty for the two of us. While we ate, the restaurant filled up, from what I could tell with general Sunday night regulars. This looks like a good place to hang out after a day of fishing on Greers Ferry or the Little Red. It's comfortable. I noticed there's a Wall of Fame on the back wall of DJ's Diner. I didn't examine it, but perhaps I should, just to find out if the photos there are former patrons or just groovy froods the owners like. I also noted the sign hanging by the television saying NFL games would not be carried. At some point I will have to be back by for breakfast. You will find DJ's Diner north of the Heber Springs and Drasco areas, in the Concord community, right along Arkansas Highway 5/25. It's open seven days a week, 6 a.m. to 7 p.m. Breakfast is not served after 11 a.m.
Click to enlargen menu pages. Hi! 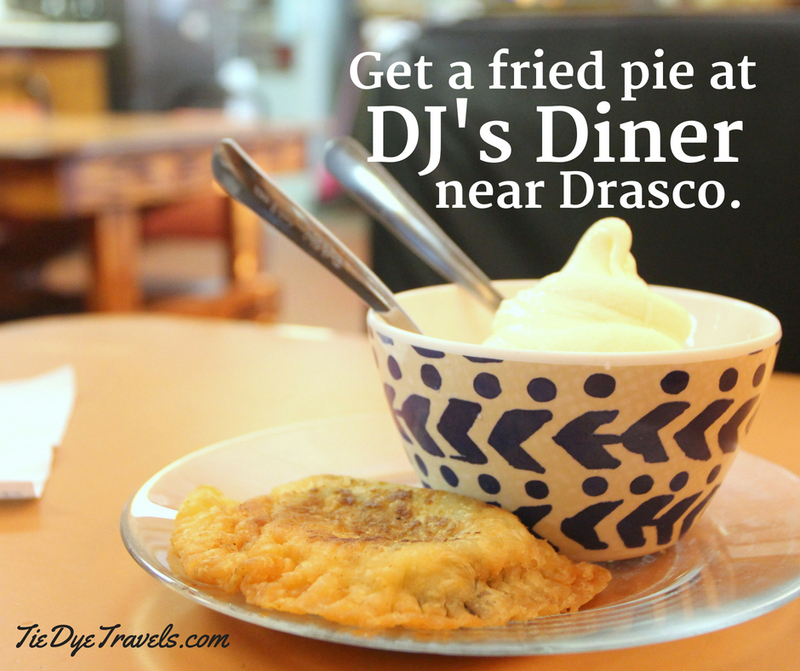 I live in Drasco, only a few miles from DJs diner. It is one of my favorite places to eat! Their catfish is delicious, and they make some amazing milk shakes!